some challenges that we had to negotiate through its content to create robustness and credibility in the assessment. Before jumping into key points and provide you with explanation, I would like to walk you all through interesting reading that I have been able to re read again and get insight now. I think - this is the best of time to re think into how we have been able to fare with our effort to secure oral cholera vaccine to use in heavily affected districts of Nepal. One fact we all agree that methodical approach applying epidemiological tool for effective control and prevention of the disease under radar is the answer. This is well said in the blog post by Dr. Sack in Gates Foundation's Inpatient Optimist. In the same post, Dr. Sack also mention the importance of rapid diagnostic that is much improved in terms its ease of using in the real field situation. We therefore need to apply this available tools to the fullest. Hope we would be able to use them in Gorkha and other high risk districts this year. Another blog post in PLOS Speaking of Medicine by Lorenz Von Seidlein is a must read for those involved in relief work in Nepal. Dr. Lorenz writes passionately what he saw and what the risk assessment was all about and its implication. His blog also says a lot on our approach to assessment. The main goal of our risk assessment was to use the available tool in the "real" field situation and contribute to national effort in the infectious disease control and prevention. We were able to conduct the assessment within a week reaching every districts and some accessible villages and share the findings to "steering committee for enteric diseases" under the leadership of Directorate General, Department of Health Services, Ministry of Health and Population, Nepal. Based on this assessment, Government of Nepal firmly decided for preventive cholera vaccination in selected earthquake affected districts. Also, while I am thinking and writing on risk assessment tool - I was following Tweeter for tweets related with cholera and its oral vaccine. One tweet caught my attention - it says "Promise is seen in an inexpensive oral cholera vaccine" posted through NYTTIMES, while Reuters US edition reports a trial recently conducted in Bangladesh - "Oral Cholera vaccine could speed control efforts" Reading all these reports, we can get a sense of urgency in terms of increasing cholera outbreaks across the globe and need for cholera vaccine in a situation as a result of either human created or natural disaster like Earthquake. On this background, we are cognizance of the importance of objective risk assessment in countries or areas at risk of acute watery diarrhea including cholera. Now let us dive into our key points of discussion. First key point first, you may be still wondering what is this risk assessment of possible cholera outbreak? Well, this is a tool which tries to measure the risk of cholera in the communities using both objective and subjective questionnaire. The objective component of the assessment would be measurable through available data and some of those information can't be assessed objectively have to be collected through subjective methodology. Most importantly, this assessment was done within few days, so this has some limitations. However, the main objective of the assessment was to objectify the risk of possible cholera outbreak(s) in Earthquake affected districts, so that would assist key governmental officials and donors in decision makings. Now let us go one by one to the key points that I would like explain to all the readers. The point that we need to understand what was the need for the risk assessment post earthquake in Nepal? To answer this question I would like to share Sachin's (from www.ivi.int ) famous phrase he used in recent conversation here in Nepal - " Earthquake was a big surprise to all of us, but monsoon is not !!" This is true - the recent Earthquake with first epicenter in Gorkha and second one in Dolkha affected millions of local people and thousands of them lost their precious life. Now, our people are very well coping with the adversaries and now rebuilding the villages and urban cities with their bare hands. On the other hand as a formidable challenges, monsoon has already started and there are every risks of infectious diseases outbreak(s). In particular, all the public health professionals are primarily concerned with water - borne illnesses in remote areas. In our conversation with senior managers in Epidemiology and Diseases Control Division (EDCD), they are concerned with possible outbreaks of cholera, which can cause deaths among vulnerable population (children, senior citizen, pregnant women, sick and infirm). And this cholera outbreak can be explosive in areas where the health care delivery + disease surveillance system is inadequate and where water sanitation and hygiene condition is poor. 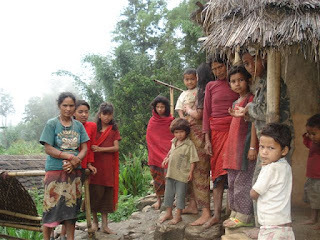 For example, we do not have to go far - Jajarjot cholera outbreak in 2009/10 took more than 500 life with thousands affected, It is therefore we do not want another Jajarkot tragedy. For this precautionary public health measure, we need to have risk assessment in the communities so we will be able to act rationally to carve out preventive measures in the high risk communities. Another key point that we had to adapt according to the local situation was the approach to the risk assessment. In this assessment task, John Hopkins University (JHU) lead in order to fine tune the tool available. In the tool, we made sure it covers all points that assess the infrastructure damages, the water sanitation and hygiene status, public health preparedness in terms of surveillance, disease reporting mechanism, case management capability and other environmental factors that may play role in the infectious diseases dynamic like population, transportation, weather patterns and health behaviors etc. The main strength of our assessment was that we visited most of the affected districts and interviewed key public health professionals, local health post in charges, nursing staffs, local people and volunteers. The only limitation was that we could not visit the most remote villages heavily affected by the earthquake due to geographical challenges in front of us. Once we finalized the tool, the risk assessment was conducted smoothly except in some districts where district public health officer in charge did not have time to listen to us and even did not want to hear the word "cholera vaccine" and in some places, WHO field staffs were a bit uncooperative in our field experience. This was completely opposite to what I had in my mind of WHO as an international organization with such a global visibility. Here I will not write about the bitter experiences, however I have convinced that it is people in the organization that my tarnish the image of the organization, not the organization itself. Once we completed the assessment, the report writing was a group work and so much learning experience for us. Lorenze (representing JHU) guided us so well in the writing part, so we finally managed to share the findings at the task force meeting chaired by EDCD director. For the credibility of the assessment, we got it endorsed from the EDCD and its strength (along with WHO/UNICEF/IOM risk assessment report) we have been able to submit ICG application for oral cholera vaccine to be mobilized in the most affected high risk villages. They deserve to be protected using the fruits of scientific endeavor like vaccines and nobody should deny just because they lack public health sense of urgency and unaware of "equity" and "justice" they deserve in the remote parts where people are unaware what lies ahead !! So I would say - "No more Haiti situation in Nepal!!"